Reader Survey: Is BABS here to stay? I introduced the Broad Assessment Balance Sheet (BABS) back in January 2016. It arrived as the logical evolution of the Mayberry Method and other “embrace imprecision” philosophies that I have written about for four or five years. BABS has made some noise. It seems that nearly every radio interview I do includes some discussion of her underlying concepts. Many, many readers have written me with positive comments and success stories. But it’s all anecdotal feedback. Happy readers are more likely to speak up on their own; unhappy readers tend to just discard a concept they don’t embrace and won’t usually express their opinion unless asked. In the recent reader survey, I tried to get a gauge on the BABS concept itself. More interesting, I asked the same questions in last year’s survey so now I have the beginnings of some trend data. We cannot project performance with enough precision for it to matter in building our fantasy teams. I was disappointed with the results from this basic foundation question. Pretty much all of BABS’ ratings are driven by the idea that player projections are faulty. Just over a third buy in completely and that hasn’t changed in the past year, but more people are uncertain. Perhaps I need to provide more examples in the future. Grouping players into asset groups is better than trying to rank them using projections. It’s a bit odd to get more buy-in here given that this concept relies on faulty projections to make sense. But I won’t question positive results. Separating assets and liabilities is better than trying to integrate risk into a player projection. About the same buy-in as last year. Consistently, about 80-85% of respondents at least agree with these concepts in theory. The injury to Cespedes makes the first comparison more difficult. Davis is currently earning $13 to Stanton’s $17; Davis has a few more HRs, Stanton about a 50-point edge in batting average. But Stanton cost about $10 more on Draft Day. We’ll see. The variance in market value of the above comparisons represent profit opportunities I can trust. While fewer were on board with the player comparisons, many more agree that the concept provides actionable profit opportunities. That’s all that matters anyway. In all, I think these are positive trends. Next week, I’ll address specific comments many of you made on the surveys. 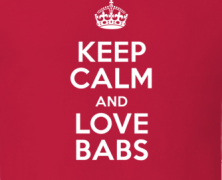 For me at least, BABS is here to stay. So far this year, drafting with her has yielded 2nd place in my NL-only league. I dropped Gsellman, I couldn’t wait any longer and dropped him to make room for Matt Adams. The rest of the draft I stayed patient mostly because my draft picks weren’t duds. As for my DL, I avoided INJ- as much as possible. Being NL-only, I had to take on more inj- in a deep league. Thus far I’ve had minor DL impact, with only Polanco as the high impact player. Could be luck, but it’s one of the reasons why my team has stayed afloat: good health. The one thing I hadn’t anticipated, is that I’m doing well in most categories except power: HR and RBIs, last place in both. I drafted with heavy early for power according to BABS, but I’ve fallen so far back in RBI, -24 to 9th place that I may just punt. This may be my only headscratcher. Without looking at projections, I couldn’t have guessed that my hitting would be so imbalanced. There is hope. Polanco seems to have his power back, Joseph woke up and Conforto is being the guy we all knew he’d be. I’ve bought in on BABS completely for drafting. It’s my in-season management that will need work. Keep up the great work Ron! While people are making judgments about BABS for this season, let’s remember that it we’re only about 1/3 into it. In some of the leagues I’m in, people are bailing on Miguel Cabrera. Is he going to remain a .250 hitter and hit only 1 HR every 20 games? I’m betting no. I think if you look at players’ BABS history, profit will be there for as you scan the available pool. BABS benefitted me last year, and I’m willing to bet it will pay off again this year. Patience, patience, patience. New to BABS this year. I really like the info but had trouble streamlining it enough to draft using it. I hand wrote multiple pages for each position. I was able to use that but could not keep up with the deficit category as the drafts in the NFBC went pretty quickly. I still did pretty well, currently in 3rd and moving up. You need to learn basic spreadsheet searching/filtering/sorting techniques. Someone who know these things could teach you in 30 minutes — less than the time you spent handwriting everything. With basic spreadsheet skills, BABS will be much, much more useful under pressure. Alex Wood, Matt Kemp, Eric Thames, Lance McCullers, Joe Votto, Jay Bruce, Corey Dickerson. The one wart has been Liriano. Doing a draft with my cheat sheet ordered by BABS proved to be difficult this year. I like looking at the BABS assets/liabilities opposed to stats and loved using my accumulation of assets/liabilities to decipher how my squad was being built as the draft went along. But it took too long to locate players on my sheet. So I’m going to have to either draft off the spreadsheet from my laptop or I’ll order the sheet based on my rankings but keep the liabilities there. The last point I’ll add is that i’ll be using BABS for fantasy football. I always just put my guys in tiers but I’m going to use BABS to hone in the teirs. I’ll need different assets and liabilities for each position but I love the concept of seeing a guy get nominated, then seeing the bidding get over your limit but being able to justify passing up on a guy because “Player Y is in the same grouping as Player Z and is projected for 10 instead of Player Z’s 20 projection”. I used BABS to build a pitching staff in an NL only league. Results are less than encouraging: last in ERA, last in WHIP, next to last in Wins. Strikeouts are 3rd place. Left the auction with Gsellman (M, e, k), Nola, Cecil, Buccholz, Urias (M, ER, KK), Addison Reed, Familia, Samardzjia (F, k), Montgomery, H. Rondon. Buchholz bombed after two starts, Nola & Montgomery were dealt away, Cecil was released and then there is Familia – although have Reed offset his loss quite a bit. In late April traded for Lackey (F, e, k) & Corbin (M, k). Since the trade both have been fairly wretched. Love the concept, disappointed with the results to date. BABS is here to stay for me. I strictly followed BABS in my 12 team NFBC online game. 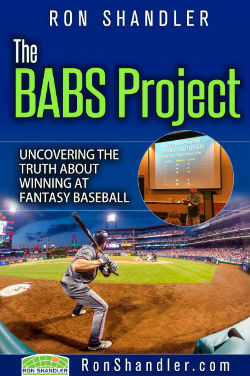 My only addition was running probability analysis using ADP on the Top 200 BABBERS I wanted. The result was I knew what round still gave me an 80% chance of getting them. Perhaps also a little addition is that I ignore all updates. Every FAAB pick I’ve made, I’m still using the original March 31st data instead of allowing 50 games to sway me. * 17 of my first 19 picks were in BABS top 100 and all 19 remain on my roster. The other two, BTW, were Michael Brantley 337 and Greg Holland 160 who were hunch bets in rounds 13 and 14 and turned out okay so far. * The only high picks I’ve lost to injury so far are Pollack (expected risk) and Kluber and Hamels who were unexpected but it happens but that is 3 of my first 6 round picks. Ugh. * I obtained relatively highly rated BABBERS in the 29th round (Conforto “buy skills not playing time”) and the 27th round (Corey Dickerson – I gladly risked his inj. for his power). * I’ve replaced the other 7 draft picks (20-26 and 28 and 30) with the following players dumped by other teams but still rated highly by BABS on March 31: Vogt 110, Tommy Joseph 69, AdGone 54, Matz 131, Sonny Gray 210, Alex Cobb 220 and Andriese 221. All have been helpful since my two aces (Kluber and Hamels) and my second best hitter (Pollack) have been gone. Things could change but I’m on top of league despite huge letdowns so far from top 19ers LeMahieu 50, W Contreras 33, Salazar 100 and Grichuk 53 – all of whom I expect to revert to the norm while overachievers like Conforto and Corey will likely regress. But I feel like I have strongest roster in years and so I might be competitive the rest of the way, which hasn’t been true for a few years. BABS is my go-to draft source from now on. It really helps to run mock drafts before drafting – it gives you a sense of the order of your picks, and you’ll find the same BABS guys falling in your lap consistently draft after draft. Before the draft, I targeted Vitro, Darvish, Archer, Lemahieu, Peraza, Mccullers, Anderson, Inciarte and Owings as BABS value picks. Because BABS made it so easy to project value for each round, I was able to take fliers on injury risks like Stanton and Martinez. I’m currently 3rd in my league, and with some key trades I’ve acquired Jensen and Melancon to shore up Saves. This was by far my best drafted team in my career…thanks Ron and thanks BABS! *Based on one player’s experience. Results may vary. Drafter used BABS but also owned a Forecaster and liked hitters with good contact rates, pitchers with good command and players who have not badly burned him in the past. He also likes Victor Martinez. After 8 weeks, the 11 points-league teams are a combined 49 wins and 39 losses. One team is 6-2, six are 5-3, three are 4-4, and the snake bitten Plutoids are 1-7. These teams were 42-24 two weeks ago before going 7-15 the last two weeks with some injuries affecting these teams. These leagues favor pitching, both in the point system and in teams looking to use two-start pitchers with only weekly changes allowed. With the 9 roto teams, 2 are in first place, 2 are in second, 3 are in fourth, with Taco Corp in 8th and the Priceless Hummels in 9th. These leagues cost $20 to enter and pay $100 for first and $50 for second so right now that $180 worth of players is generating $300 worth of results is one way to look at it. These are 5×5 roto leagues with 10 teams so there is a maximum score of 50 points for pitching and 50 for hitting in each league. These teams are averaging 32 hitting points and 28 pitching points per league. That’s not a huge difference, but the two first place teams have splits of 50(hitting)/26(pitching) and 46/24. The second place teams are 34/30 and 25/40(this outlier is a good team with better pitching). The fourth place teams are 33/26, 31/25 and 28/29. The bottom dwellers are 15/36 and 23/20. Seeing that the better teams are the ones with better hitting, along with higher hitting rankings vs. pitching, and the better performance in roto leagues vs. points leagues tends to show that BABS did better with hitters than pitchers. Lastly, of the leagues above, a first place and fourth place roto team, along with a points team that has 5 wins and 3 losses are AL-only. The NL roto teams are in second, eighth, ninth, and the NL points team has 4 wins and 4 losses. I know 20 teams is still a small sample, but I had this data and literally no other audience with whom to share it. Telling your teenagers about your observations using a new system for analyzing baseball players doesn’t go over that well. In short, thanks for reading. Hi Ron, I am currently 8th in a 13 team Roto League in steals and HR. I only need about 8 steals to move up some, but am quite a bit behind in HR. The top free agent in steals is Buxton and the top HR free agent is Schimpf. Both have low Avg but Buxton is .282 and Schimpf is .295 in OBP which is what our league uses. The only player I could cut for one of these would be Castellanos who is batting only .212 with an OBP of 295. After today he only has 5 HR and 2 steals. I have Chris Taylor and Marwin Gonzalez that I could use at 3rd. They are both hitting better than Castellanos. According to BABS, Schimpf is a PW+ and is good in OBP where Castellanos is only PW. The only draw back is Schimpf is a M player where Castellanos is F. Buxton is p and SB+. Can you recommend a change for one of those two or should I keep Castellanos? Not much trading in this league either. Thanks Ron and I think BABS is great for the first time I have used her. It was a little hectic drafting while trying to keep track of INJ and P and the rest, but I think I made out OK. 2nd place so far but it seems like my pitching staff is all going on the DL! If you recommend a change, I know it is hard to predict, but, what amout of FAAB $ would you use. I have about $740 left from 1000.